"Look at it this way Charlie Brown. Every time you lose, you learn something." Charlie Brown responds, "That makes me the smartest man in the world!" Certainly this team made me a lot smarter than ever before. The YHS team, however, had heart. With only a couple of players returning, this team didn't have a lot of experience. As the legend goes, I actually did walk down the hallways of YHS asking boys "Did you ever play soccer before?" to recruit this team. When we held our earliest practices, with as few as seven people, I would end with "Hey, and next time bring a friend." The squad we ended up with at the tournamet had about as much experience, overall, as most of the j.v. teams we played with only a single, genuine midfielder. Sometimes it seemed that the very elements conspired against YHS. We came out playing very strong against Kinnick only to lose on two penlty kicks assessed during the very last few minutes of the game. Twice we seemed really well-prepared to play our games only to have them snowed out. When the league re-scheduled the tournamet, they scheduled it so that one of our best players returned to the States the week before. Playing Zama on historic Bonk Field. Through it all, however, the team refused to give up. 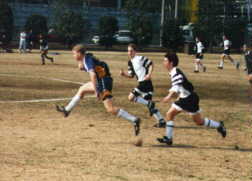 Captain Robert Bankey, despite a serious mid-season injury, came back and played midfield. Cesar Quezada and Robert Theriault both became bona fide scoring threats during the season while Ryan Scott and Scott Nemoto both had good tournaments. Adam Sheridan and Allan Kinchloe helped shore up the defense while goalie Greg Teague, one of our few returning players, kept us in a lot of games that we wouldn't have been in otherwise. By the end of the season this was a much better team with a promising future. One thing hadn't changed: We still led the league in heart. Sayama Sports Club 7-0 over YHS. A much-improved YHS Panther Boys's Soccer Squad went down to defeat in a Saturday match against the Misawa Eagles 3-1 on Saturday. 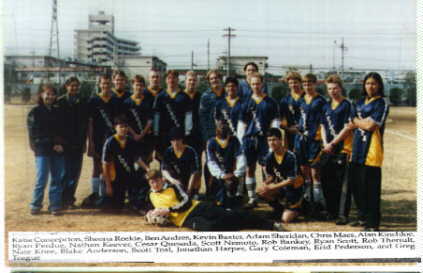 Greg Teague played a suburb game in goal for Yokota. YHS forward Robert Theriault scored YHS's first goal of the season. Edgren boys played and won a pair of non-league games with Yokota 5-0 and 3-1. Robert Theriault scored the lone goal for the Panthers in the second game. The Boys soccer team has gotten off to a slow start this year. With a lot of new players and few returnees, they have not quite figured out how to work as a team yet, but the season's just beginning. To start the season Yokota went to ASIJ, coming back disappointed. Saturday ASIJ came to Yokota, Yokota again taking another loss. They played better than the last time they played them but not good enough. Despite all the losses, the boy's soccer team has started to look better. They went to Kinnick December 15th and came back to Yokota feeling proud that they had won their very first game. Yokota beat Kinnick 2-1. (Note: Actually, we lost 2-1, but it seemed like we won 2-1 at the time. The j.v. won 2-1). Daniel Fruit said, "We played well and worked as a team and I am very proud of them." Our next game scheduled is January 10th at YIS. Kinnick got into the win column with by downing Yokota (0-3). YHS scored first on a goal by transfer Cesar Quezada, but the Deviles rallied on second half goals by Jack O'Conner and two penalty kicks. Paul Premoe scored off a pass by Ian Teegarden and Scott Teal scored the wining goal as Yokota's Junior Varsity downed Kinnick's JV 2-1. On Friday night, a very strong Zama team defeated the YHS boys' soccer team 3-0. After the game, they challenged the Panthers to play a rematch-at YHS. They seem to think that they can beat the Panthers again with no problems, but can they REALLY beat YHS on its own, wind-swept turf? Come out Saturday 1100 and root on YHS! On Saturday, Yokota High School scored its first points of the season, tying St. Maur's 4-4 in a high scoring contest. Yokota's defense, anchored by team captain Rob Bankey, played well. On offense, forward Robert Theriault scored once, Cesar Quezada scored twice, and midfielder Ryan Perdue added a fourth goal. 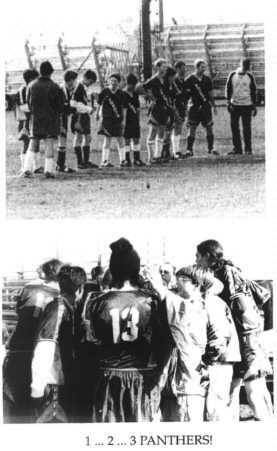 After the game ended in a tie, the two teams held a shoot-out. Two sets of five kickers from each team shot at the respective goalies with each scoring 8/10 shots. For YHS, Ryan Scott, Adam Perdue, Cesar Quezada, Ryan Perdue, Robert Theriault, Kevin Baxter, and Alan Kinchloe all scored. After penalty kicks left the score still tied, refs declared the game a tie. On Sunday YHS's assorted varsity (A+B+coach) team lost an informal game to Richard Garcia's all stars (an adult team) 5-3. Ceasar Quezada scored twice while Gary Coleman added a third. Senior forward Daniel R. Fruit added an assist for YHS. Ben Andres, Scott Teal, Karl Pederson, Matt Downing, Jonathon Harper. On Saturday, YHS completed its Kanto Plains tournament on a winning note, defeating Zama B 2-0 in a shortened, 30 minute game. The Panthers dominated the Trojans, and only the shortened time span kept the score down. The Panthers scored on a penalty kick by team captain Rob Bankey as well as a shot by Ryan Scott. The win put the Panthers in 7th place for the league, ahead of Zama B as well as those schools who elected not to attend at all (St. Mary's B, St. Maur's A, Kinnick B, YHS B, and YIS B). On Thursday, despite losing, the Panthers played very well against both second place St. Mary's A and Zama A. On Friday, Gary Coleman scored against ASIJ B. In YHS's very close loss to an excellent, senior-loaded YIS A squad, Ryan Scott scored twice, first on a rebound from a powerful shot by Cesar Quezada and also on a booming pass from the other team captain Ryan Perdue. Scott's goal-racking performance earned him a place on the league all-star team. YHS's strong play at the tournament turned heads and should make YHS proud. YHS Varsity Wins First Soccer Game in Two Seasons! On Saturday, February 21, the YHS varsity soccer team (YHS A) beat Zama B in the very last (for 7th place) game of the tournament and the Kanto Plains season. This game, like the 5th-6th game, almost didn't take place at all. Due to rain the previous evening, Briggs Field proved unplayable and Berkey Field featured a small lake in the center of the field. By the final game, however, most of the mud in the center of the field decorated different players' uniforms on the various teams and no longer presented so much of an obstacle. With little field left, and a biting wind, the teams played only 15 halfs. In the first half, Yokota scored on a penalty kick from team captain Robert Bankey. A few minutes later right forward Ryan Scott added another goal (his third of the tournament). The remainder of the game consisted of YHS simply attempting shots punctuated by a Zama B breakout here and there. Coach Fruit commented. "We came very close to winning several games during the season. Bad luck and small mistakes kept us out of the win column. With a win this late, though, we might simply count this as the first win of next season and go from there." The day before, YHS and YIS played what was possibly the best game of the tournament. Each team had to win in order to play in the fifth-sixth game (which YIS won). YIS came off a tough loss to ASIJ A while YHS had lost to ASIJ B. YIS had a squad loaded with seniors while most of YHS's squad were freshmen and first year players; YHS, however, had a break before this game while YIS did not. Both teams play a similar style, with a lot of long runs up the sidelines, big passes, crosses, a kind of "fast break offense," not subtle but exciting. YIS scored two quick goals on simple missed coverages by YHS defenders, and YHS seemed to lose heart. Then Cesar Quezada and Rob Bankey took the ball down the very center of YIS's formation, and Cesar took a shot at their goalie. The shot bounced out, but Ryan Scott, right forward, nailed it into the goal. Scott's goal rallied YHS. Even when YIS got a third goal, YHS responded with a long pass from Ryan Perdue, a defender, to Ryan Scott who put in a second goal to keep YHS within a goal. That set the stage for an exciting second half with both teams making runs up the sides, with aggressive defensive play as YIS tried to put YHS away and YHS tried to make up that last goal. YHS had the disadvantage of having four starters, including the goalie, injured or hurting. On the other hand,this game sent two YIS players to the sidelines limping. That's how hard both sides played! YIS got a penalty kick which (they hoped) would put YHS away, but Greg Teague, despite playing on a trashed ankle, STILL stopped the shot. Until the very end, it looked like YHS might still score one more time, but YHS couldn't quite get it in, and YIS escaped with a well-earned win. Commented YHS's Coach Fruit: "It was one of those games that, even if you lose, makes you proud to coach your team!" Picture a field in February, two teams play soccer. At one end, you have a team in red, the Yokohama International School Dragons. Smarting from a loss not an hour earlier to eventual tournament champions ASIJ A, they look tired, but experienced. Many of their players sport beards, an appropriate look for a team with 8 starting seniors. At the other end, you have a team in blue and gold. They have a hungry look in their eyes also. Through an entire season, they haven't won a game. On this very field two months earlier, they watched Kinnick refs award two quick penalty kicks to the home team and an apparent victory disappeared. Unlike the Dragons, they have a very youthful appearance, as befits a team with only two seniors, captain Rob Bankey and towering Scott Nemoto. While they have two hours more rest than the Dragons, they also have a squad limping with four injuries. The Dragons enjoy a 2-0 lead, both courtesy of Panther defensive mistakes in the middle, but team captain Rob Bankey and Cesar Quezada drive up the field, determined to score. The Dragons, however, have already played the Panthers long enough to know, not to give Quezada a shot of any kind, let alone a good one. Quezada gets the ball, shoots anyway, and misses, the ball deflecting off the YIS goalie. Forward Ryan Scott nails the ball into the goal. The Panthers trail only by a goal. Both teams become even more intense, intense enough to send two Dragons out of the game, limping. The two play a similar style, with quick runs, fast breaks, and long passes. YIS scores again, determined to bury the Panthers. Ryan Perdue, deep in the Panther defense, sends a long pass downfield, past even his own midfielder, Nemoto. Ryan Scott chases it down, and puts in his second goal of the game. Finally, YIS gets a break. The refs charge Yokota with a foul inside the box. Yet again, it seems, YHS will lose on the same field due to a penalty kick and with some of the same refs. The YHS player feints and shoots. Goalie Greg Teague, playing on a wounded ankle, STILL gets in front of the ball and hits it forward, and the YHS defense sends it out of bounds. For twenty more minutes the two teams battle, YIS trying to put in the goal to finish the Panthers, and the Panthers trying to send the game into sudden death. In the end, neither side scores, and YIS wins a hard-won win 3-2. YHS endures another tough loss, but play very well in a game that some observers consider the best of the tournament. On Saturday, YHS plays in the 7th place game against Zama B. Even though the game lasts a scant 30 minutes and takes place on a field racked by icy winds and deep in mud, YHS has plenty of time to win. Rob Bankey scores as does, again, Ryan Scott. The Panthers finally won a victory ending the 1998 season-and setting the stage for an exciting 1999 season. YHS B ends its seasons with a record of 2-1, i.e. with more wins than any B team except ASIJ B. Permanent members include: forwards Ben Andres, Karl Pedersen, and Scott Teal; defenders Jon "Cupcake" Harper and Matt Downing; and goalies Kevin Baxter and Allen Kinchloe. YHS A ends its season in 7th place out of about a dozen Kanto teams. Tournament team members included: defenders Kevin Baxter, Allen Kinchloe, Nathan Knee, Joe Sanz, and Greg Teague (goal); midfielders Robert Bankey, Chris Maes, Scott Nemoto, Karl Pederson, and Gary Coleman; forwards Ryan Perdue, Scott Teal, Cesar Quezada, and Robert Theriault; midfielder-defenders Ryan Perdue (co-captain), Adam Sheraden; managers Peter Brusseau, Katie Concepcion, and Sheena Reekie. Congratulations to YHS boys' soccer players on a sucessful season.